Is Cocoa Butter Vegan & Dairy Free? Cocoa butter (also known as Theobroma cacao) is basically the fat that has been extracted from cocoa beans. Its most common use is for making chocolate. You know how the delicious chocolate just melts in your mouth when you eat it? This unique creaminess is possible due to the presence of the edible fat that has been taken from the cocoa beans. A lot of people ask, “Is cocoa butter vegan?” Yes, cocoa butter is completely part of a vegan diet because there are no animal ingredients or by-products involved in the making of cocoa butter. The confusion arises because of the word “butter” that people associate with dairy milk. However, cocoa butter contains zero percent dairy, so it is entirely vegan. How Is Cocoa Butter Made? The process begins with the football-sized cacao pod, which contains cacao beans. These beans are then removed from the pod, cleaned, and roasted to enhance their flavor. This step turns the cacao beans into cocoa beans. These cocoa beans are then extracted from their shells, producing tiny nuggets known as “nibs,” which are then ground into a liquid called cocoa liquor. When pressed, the cocoa liquor separates into two substances: one is the remnants of the nibs, which is used to make cocoa powder, and the other is a fatty, yellowish substance. This is cocoa butter. Cocoa butter does not contain any proteins and amino acids, minerals, or carbohydrates. One cup (218 g) of cocoa butter does contain 1,927 calories, vitamins E and K, and some fats and fatty acids. Cocoa butter offers many of the same benefits as a crunchy bite of dark chocolate. Using it will also give your dish a tinge of chocolate flavor. Due to this quality of cocoa butter, it is often used in place of regular butter in dessert dishes. What’s more, cocoa butter has a high smoke point of 370 degrees F, which means you can heat it at a higher temperature than other cooking fats. You can use it to cook any dish you want without worrying that the butter will burn. Just be sure to heat it to no more than 10 degrees below its smoke point. Today, researchers know that plant-derived saturated fats are actually beneficial for reducing the risk of cardiovascular diseases. Cocoa butter contains polyphenolic components that have been shown to help lower inflammatory markers involved in atherosclerosis (hardening of the arteries). This is why cocoa butter is considered an anti-inflammatory food. Also, cocoa appears to help with lipid (fat) metabolism and is linked to a decreased risk for cardiovascular events, such as a heart attack. Eating dark chocolate in moderation is actually good for your heart health. The rich blend of fatty acids and antioxidants in cocoa butter also reduce inflammation of the skin. If you apply cocoa butter to psoriasis, eczema, rashes, or other types of inflammation on the body, you will get quick, soothing relief, as well as a delicious aroma. Better still, you can consume cocoa butter in the form of chocolate, which is the most common way people choose to obtain these health benefits. Several studies have shown that the plant polyphenols present in cocoa butter exert antioxidant powers within the immune system. They also fight DNA damage and cellular mutations. These are thought to cause diseases like cancer, cardiovascular disease, and autoimmune conditions, such as chronic fatigue syndrome (CFS). A small double blind, randomized, clinical pilot crossover study compared the effects of polyphenol-rich chocolate (PR) to simulated iso-calorific chocolate (low polyphenols (LP)) on fatigue and residual function in subjects with chronic fatigue syndrome. Subjects reported improved symptoms after they were given PR chocolate for eight weeks, while their symptoms deteriorated following an eight-week intake of LP chocolate. The researchers believe that polyphenol-rich cocoa butter may help improve the neurotransmitter hormone imbalance that’s been linked to CFS while also working as an immune system booster. Cocoa butter moisturizes the painful sores inside your mouth and lips that have developed recurring blisters. Using cocoa butter gives you great relief and helps heal as well. Specialty coffee: Add it to decaffeinated coffee and watch it cream up like a superfood mocha that gives you the benefits of coffee without the caffeine jitters. It also gives you omega-3, omega-6, and vitamins E and K.
Pastry topping: Your toast will taste heavenly when you smear cocoa butter on it and eat it with or without nut butter, banana, or warm honey. Your pancakes and waffles topped with cocoa butter will taste delicious as well. Baking ingredient: Swap into any baking recipe. All you have to do is replace the butter or oil for cocoa butter and get all the added benefits. You can stir it into oatmeal, grits, or rice pudding. Use fresh, cold water to clean the cocoa beans and air dry. Roast the cocoa beans at about 120 degrees Fahrenheit for 90 minutes. Ensure the heat is applied evenly to all the cocoa beans. To avoid scorching, use a fan to immediately cool the beans to room temperature. Lightly tap the cocoa bean with a hammer to remove the inner nib from the loosened outer shell. Transfer the smashed cocoa beans to a sieve, placing a bowl underneath. Carefully shake and apply pressure to the cocoa beans and allow the nibs to fall through the sieve into the bowl below. Make a “cocoa liquor” by grinding the nibs with a coffee grinder. The heat generated will melt the fat in the nibs and turn them into liquid. Pass the cocoa liquor through a screw press to extract the cocoa butter. Your homemade cocoa butter is ready to use. Twenty-two pounds of cocoa beans will produce about one quart of cocoa butter. Sort the beans according to size for a more even roast. Remember to avoid crushing the cocoa beans into a powder when you are removing the shells. Also, do not use an open flame when roasting the cocoa beans because the shells are flammable. Place chunks of cocoa butter into the upper insert of a double boiler. Make sure water doesn’t touch the bottom of the pan or get inside. Measure out one cup as it melts, adding more as needed. Transfer the melted cocoa butter to a mixing bowl. Add the cacao powder, honey, and vanilla and mix well. Pour mixture into chocolate molds and fill completely. Refrigerate the mold for at least three hours to allow it fully harden, and then unmold. The chocolates can be eaten cold or stored at steady room temperature. Preheat oven to 400 degrees F. Mix flour and salt in a small bowl and set aside. Combine cocoa butter and sugar in a medium-sized bowl. Whisk in milk and egg yolks. Slowly mix in flour and salt mixture until just combined. Roll cookies into balls about the size of a quarter and place them on ungreased cookie sheets, three-fourths of an inch apart. Bake the cookies for seven minutes. The soft cookies will harden as they cool down. The fat extracted from cocoa beans is called cocoa butter. It is 100% vegan because it is derived from the cacao plant and not from any dairy animal or process. Cocoa butter can be used in several ways but its most common use is in making chocolate or chocolate-based dishes. 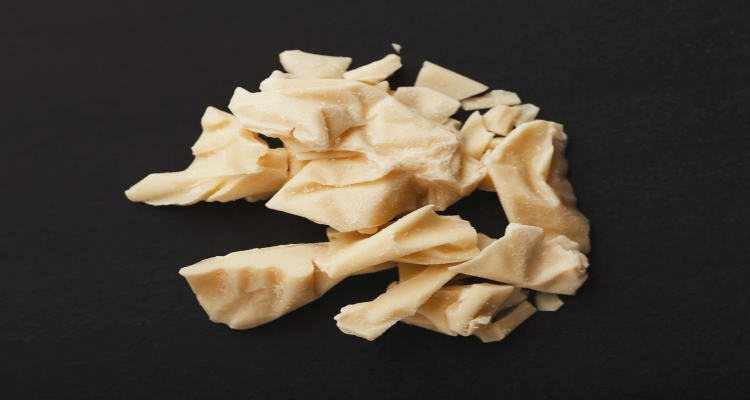 There are several reported health benefits of cocoa butter, such as improved heart health, reduced inflammation, increased immunity and energy, and soothed mouth sores. You can use cocoa butter to get the double benefits of better health and the chocolatey flavor. You can add cocoa butter to your decaf coffee to gain many of these benefits without worrying about the bad effects of caffeine. You can also use cocoa butter to make mouth-watering and delicious eatables like homemade dairy-free chocolate and cookies that will satisfy the taste-buds of every member of your family and friends as well. If you’re a vegan cooking any dish that needs butter, why not go with cocoa butter instead? Adams, A., “Is Cocoa Butter Vegan and Dairy-Free?” the spruce Eats, July 3, 2018; https://www.thespruceeats.com/is-cocoa-butter-dairy-free-1000939, last accessed November 5, 2018.
https://happyhappyvegan.com/is-cocoa-butter-vegan/, last accessed November 5, 2018. Kent, “Is Cocoa Butter Vegan and Cruelty Free?” Vegan with Kent, December 9, 2017; https://veganwithkent.com/is-cocoa-butter-vegan-and-cruelty-free/, last accessed November 5, 2018.
https://nutritiondata.self.com/facts/fats-and-oils/570/2, last accessed November 5, 2018.
https://www.nutritionadvance.com/cocoa-butter-nutrition/, last accessed November 5, 2018. Sathyapalan, T., et al., “High cocoa polyphenol rich chocolate may reduce the burden of the symptoms in chronic fatigue syndrome,” Nutrition Journal, 2010; 9: 55; https://www.ncbi.nlm.nih.gov/pmc/articles/PMC3001690/, last accessed November 12, 2018.
https://draxe.com/cocoa-butter/, last accessed November 5, 2018. Staughton, J., “6 Surprising Cocoa Butter Benefits,” Organic facts, August 30, 2018; https://www.organicfacts.net/health-benefits/oils/cocoa-butter.html, last accessed November 5, 2018.
https://www.countertopfoods.com/cocoa-butter-with-benefits/?v=c86ee0d9d7ed, last accessed November 5, 2018. Gray, G., “How to Make Cocoa Butter at Home,” LIVESTRONG.COM, July 18, 2017; https://www.livestrong.com/article/183980-how-to-make-cocoa-butter-at-home/, last accessed November 5, 2018. Stevens, M., “Homemade Chocolate with Cocoa Butter,” EAT BEAUTIFUL, https://eatbeautiful.net/2015/07/04/homemade-chocolate-with-cocoa-butter/, last accessed November 5, 2018. Pollack, S., “Cocoa Butter Cookies – A Twist on a Classic,” Cup Cake Project, https://www.cupcakeproject.com/cocoa-butter-cookies-twist-on-classic/, last accessed November 5, 2018.